Our first trip out was just that—we kept moving until we found a Walmart that did not sell snow shovels. What happens when the Canadian dollar loses value and USA prices go up accordingly and we cross over into that “senior-senior” category for travel medical Insurance that severely impacts our life savings? Victoria must be a wonderful place to live but as a visitor, it is a difficult place to find your way around. Bless the GPS. Mary voiced our last GPS. She did mislead us a few times. Jill is our ever-faithful voice of direction now and she does a wonderful job. We have only experienced one failure and that was because a road had been recently closed off. I am so glad she was with us. We mostly beach strolled, people watched and ate in wonderful places—we had East Indian food, wonderful seafood and dim sum treats we haven’t had for years. Vancouver Island in general, and the central part of the east coast of the island in particular, is reputed to be the most weather-friendly area to spend a Canadian winter and became the chosen destination for our good weather expedition. We were not disappointed—It was glorious. So much to see, so much to do! There were beaches to explore, huge cedar forests to investigate, and an array of quaint stores and restaurants to visit. The multitude of small islands between Vancouver Island and the mainland are home to many artists and eccentric personalities, most of them are willing to share their views and talents with outsiders. 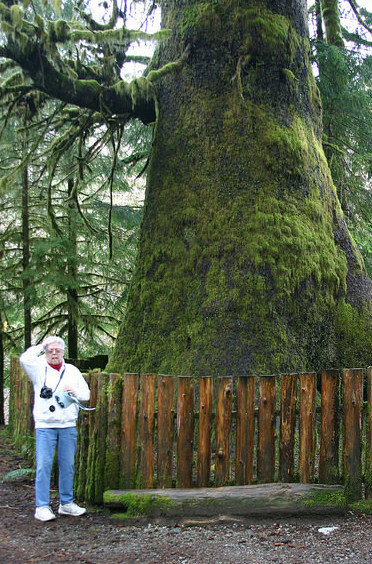 Some trees are so big that hobbits could live in them. Other trees are so twisted and stunted they look like broccoli, reaching up from a mass of thick, wet moss. The vivid greens of the moss-covered soil, the ferns that arch up towards the overhanging layers of green vegetation and the impenetrable canopy that blocks out the light can only inspire the imagination. There is a lesser travelled road called the Oceanside Route that wanders in and around the many settlements and villages along the shore. French Creek is one of those places between Parksville and Qualicum Beach. It is where many of the fishing boats bring in their catch and where you take the walk-on ferry to Lasqueti Island (home to a small population of farmers and artisans). We wandered down there to see the eagles when the herring were running. One cold and windy day, we checked into Rathtrevor Beach and just happened to see this brave and crazy fellow set up his para-sail and cruise into the icy water. Historically the Salish people had inhabited the Qualicum Beach area for hundreds of years. The word Qualicum means "where the dog (chubb) salmon run" in the Pentlach language. 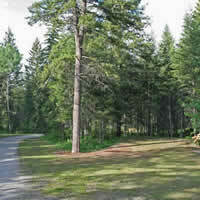 It is considered to be within the traditional territory of the Qualicum First Nation. Everywhere you look there are special manicured garden spots and invitations to beautify. The downtown is filled with specialty shops of all sizes and descriptions, along with coffee shops in almost every nook and cranny. The storms on the West Coast are outstanding and late spring brings an incomparable opportunity to watch the whales migrate from the south to the northern Pacific Ocean. Our last venture on the west side of the Island was the Wild Pacific Trail. Easy-going trails (the kind we like) wander through old growth as they hug the coastline of the Ulcuelet Peninsula. 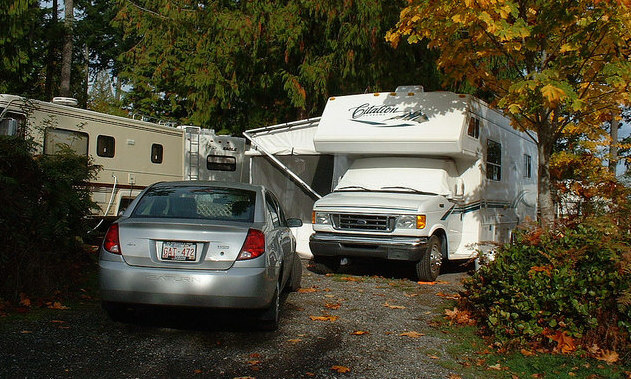 There are both advantages and disadvantages to boondocking, depending what you want from your RV experience. 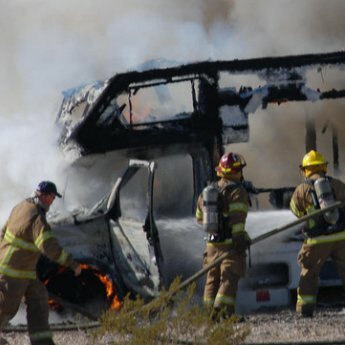 After this last summer and the total disaster in Fort McMurray, I started thinking about what we would do if we met with a disaster in the motorhome.